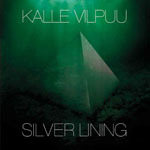 Share the post "Album review: KALLE VILPUU – Silver Lining"
I have to say I always approach guitarist-led independent releases with a certain amount of intrepidation. Often they are mere vanity projects, apeing others, badly recorded, badly executed and maybe enlisting a “name” to help sales and…vanity. Kalle Vilpuu is a guitarist from Estonia, a country not especially known for great musical exports, and he’s put together 11 tracks that repay repeated attention. It is to Vilpuu’s credit that he explores various styles and textures on this album, aided by the very competent Anrus Lillepea (drums) and Henno Kelp (bass). The opening track ‘Anomalies’ sets the scene, if not actually the blueprint, but it demonstrates how Vilpuu tastefully melds his guitar with an orchestral backdrop (provided by a real string section) and keyboard-based effects/electronica. This adds interest throughout the album, and it becomes less of a guitarist navel-gaze and more of a genuinely absorbing – and satisfying – listen. This continues with ‘Unforgiven’ with Vilpuu’s chunky metal chords and soloing, and the excellent ‘Interno’ which is enhanced by the vocals of Mari Pokinen. This particular track is a standout and opens with an Apocalyptica-esque string refrain before an Air-esque –vibe gives way to a quite wonderful guitar denouement. Pokinen returns on the attractive ‘The Touch Of An Angel’. ‘Industrial No.4′ is a fantastic metal piledriver along with ‘In The Back Of My Head’ and the monumental ‘The Aliens (Have Landed)’. Vilpuu’s guitar style is not especially derivative as is so often the case with similar guitar-based albums. The latter piece, for example, is propelled along with an infectious Kelp bass pattern and harnesses the headiness of prime-time Ozric Tentacles. Yes, this is an intriguing album! The high standards never slip, the album book-ended by that appealing blend of metal guitar and classical finesse (on ‘Forgiven’ with the flute of Tarvi Jaago) and the title track which brings together all the elements that make this album great: electronica, strings, and a persuasive guitar that peters out to a single tone. Wonderful. This entry was posted in ALBUM REVIEWS, ALBUM REVIEWS (Mobile), All Posts and tagged album, electronica, Estonia, guitar, guitarist, Kalle Vilpuu, review, Silver Lining. Bookmark the permalink.